Benjamin M. Dost joined Henn Lesperance PLC in February of 2015. 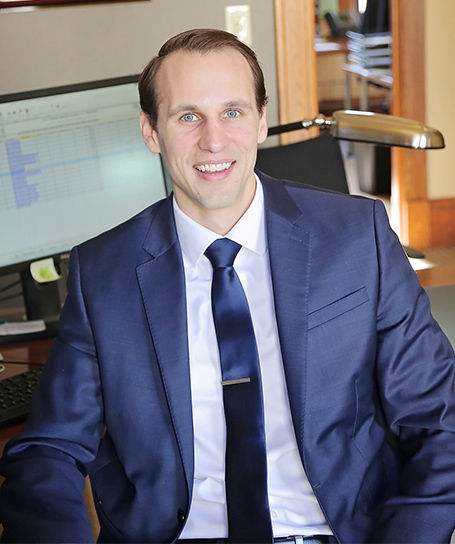 Since joining the firm, he has assisted in the successful defense of firm clients in Michigan trial courts, including writing briefs, taking depositions, and arguing motions. Mr. Dost has also assisted in preparing several medical malpractice cases for jury trial, including arguing contentious motions in limine. His goal is to develop into a “go to” trial attorney. In law school, he honed his advocacy skills as an active member of the Syracuse University College of Law Moot Court Honor Society. Mr. Dost works tirelessly to provide creative and thoughtful legal analyses, wise counsel, and zealous advocacy to our clients. Anyone who has met him recognizes instantly that he holds himself to the highest of professionalism and legal ethics. Before joining Henn Lesperance PLC, Mr. Dost worked for two years as the Family Division Referee in the 19th Circuit Court of Michigan and Magistrate of the 85th District Court of Michigan (both appointments). In those roles he heard small claims matters and adjudicated family law matters such as juvenile delinquency cases. When not practicing law, Mr. Dost enjoys spending time with his wife, Lisa, studying American history, and playing sports. In college, he played center on GVSU’s hockey team. October 2018, Motion for Partial Summary Disposition Granted. Drafted and successfully argued a Motion for Partial Summary Disposition, resulting in the dismissal of direct claims against a hospital. Plaintiff alleged that the hospital was negligent for failing to adopt appropriate policies and procedures, and for its hiring and retention of its staff. Plaintiff further argued that those claims sounded in ordinary negligence, which are not subject to the statutory non-economic damages cap. We argued that such claims sound in medical malpractice under case law, and the Court agreed. Also, the Court agreed that the claims were not contained in Plaintiff’s Notice of Intent, or supported by Plaintiff’s experts’ Affidavits of Merit, or by any expert testimony. Accordingly, the claims were dismissed. October 2015, Summary Disposition: Successfully argued and obtained summary disposition on behalf of a local nursing home based on a previously executed contractual release.